Growing up my love of radio evolved into playing radio station contests. The excitement of hearing the disc jockey say “you’re the winner” was thrilling! I won many prizes during high school…so many in fact that I was featured in our High School newspaper. I would win in friends names then go to the radio station with their i.d.’s and share the loot. Eventually I was hired by the station I loved, WQXI “Quixie n Dixie”. When I walked into the prize closet I was amazed at all the prizes that I had been trying to win. I remember my co-worker Vanessa pulling me aside one day and saying others were taking notice of how much stuff I was taking home!! 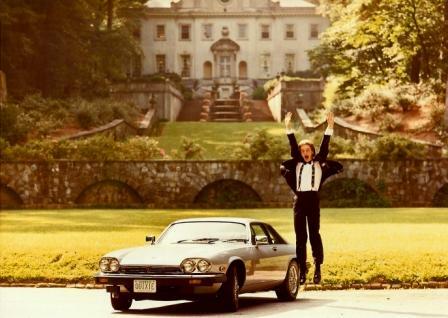 One year a local station 99 FM (WSB FM) gave away 99 keys that could possibly start a brand new Jaguar XJS. I asked my General Manager Jerry Blum if I could enter this contest and he asked why…then agreed that we could turn it into a publicity campaign…that the WQXI station mascot (“Quixie Quacker”, my job at the time) won a competitors contest!! So with that green light, I set out to win a key. The Contest titled “The Key to your Dreams” involved listening for the “key song of the day”. I listened for days trying to win a key. I even took the radio into the bathroom and remember jumping out of the shower to call in for a key. Then one day while driving around town I heard the song to “call in and win!” I pulled over to a pay phone and jumped out and inserted the coins and started dialing. (couldn’t afford a cell phone.) After multiple busy signals I got a ringing sound!! (To a contest player, a ringing sound is the ultimate sensation of reaching success!!) My heart was racing–could this be the winning moment? The disc jockey answered “99 FM Hi, who’s this?” TOM SULLIVAN!! (insert excitement here!) YES!!!! After I calmed down, I phoned all my friends…and then told everyone at work that I was “in” for a chance to win. I was at home when the phone rang and it was Lisa: “Tommy, you won the car, YOU WON THE CAR!” And an hour later I was driving over to my mom and dad’s to show them my new wheels!! 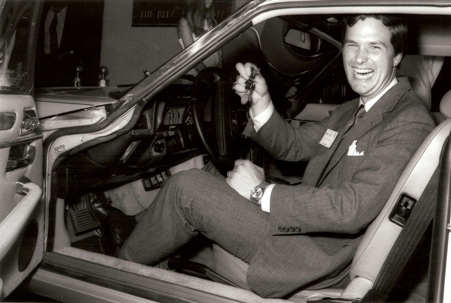 I knew from the start I was going to sell the car (no trunk space for my duck suit) and found a buyer within a month. I finally won a contest that I had entered for many years and it was from ellen!